Health Nutrition Drink vitamins minerals fiber antioxidants calcium fruits vegetables! "Well Julie we have something very exciting to present to our readers. 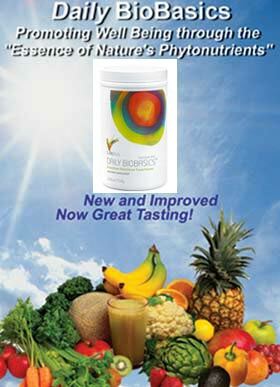 Daily BioBasics now has a fantastic new improved great tasting formula." Daily BioBasics has been upgraded to a new level in technology, both in nutritional awareness and taste. These upgrades have occurred from over two years of research and development in product formulation and nutritional technologies. And it contains no artificial sweeteners. Has a neutral balanced taste. Its taste is neutral so it will pick up the taste of whatever you mix it with. You want orange flavor, mix it with orange juice, apple - apple juice- pineapple - pineapple juice! Well, you get the idea! Nutritional products are required to be labeled such that their fiber content is listed as carbohydrates. DBB fits low carb diets just great. Daily BioBasics has 64 calories per serving and that doesn’t include the juice, etc. Provides extra phytonutrients to help you "feel the Life Plus Difference." Numerous updates have been made in the New PhytoZyme base in all Life Plus products, including DBB-this is our commitment to you. Contains 6 different high-quality specific fibers. Tastes great (naturally sweet but with only 65 calories per serving). DBB still contains 13 grams of fiber per serving and still contains all of the original types of fiber. Pleasant, Improved neutral taste-goes well with all juices, milk, soy milk, etc. Taste is improved so it can be taken in just water-for people wanting to limit carbs. Easier mixing with all liquids-juices, milk, soy milk, etc. Hydrates slower so is less "goopey” and easier to swallow. Easier clean up-glasses and shaker cups rinse out easier. Now DBB is mannitol free for athletes. Now DBB is gluten free for people allergic to gluten. Now DBB is GMO free of any soya products. New DBB was formulated with everyone in mind to make certain that it contains at least 100% of the RDA's for classified vitamins and minerals and yet gives special consideration to certain nutrients like Vitamin K and Niacin. Virtually everyone can benefit by adding New DBB to their diet. Contains at least 100% of the RDA of all vitamins and minerals that have been classified-including Calcium and Magnesium. Contains over 50% of the RDA (Recommended Daily Allowance) of high quality Fiber. Contains concentrates from 31 fruits, vegetables and herbs in the proprietary Life Plus PhytoZyme Base, plus concentrates of 25 fruits and vegetables in the basic formula. Contains over 30 different herbs, associated nutritional factors and super green ingredients. Is micronized so the particle size is ultra-small to help ensure easy mixing and optimum absorption of nutrients. Can be easily mixed with our new Super Shake for a great high-flber, protein-rich, low-carb shake.